Already a month since my last entry and to be honest not much has happened. The plants are growing very slowly, like a cactus. On the plus side, I got a compost tumbler for Christmas which is either lame or awesome depending on your point of view. It is what it looks like. You dump organic material in a glorified barrel, then spin it to mix and aerate it, thus creating an ideal environment for composting. 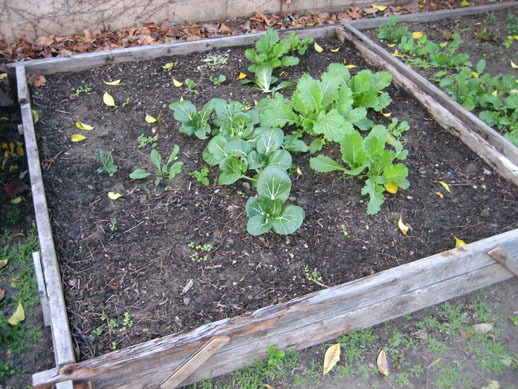 At the cost of some up front effort, building the boxes and filling them with ideal soil has proven to be a huge time saver. Weeding and watering have been substantially reduced, and the soil is rich and loose. I did manage to plant things that are able to tolerate colder weather, which includes rainy days and frostbitten mornings. In fact, the contrast between warm and cool weather plants is quite apparent below. 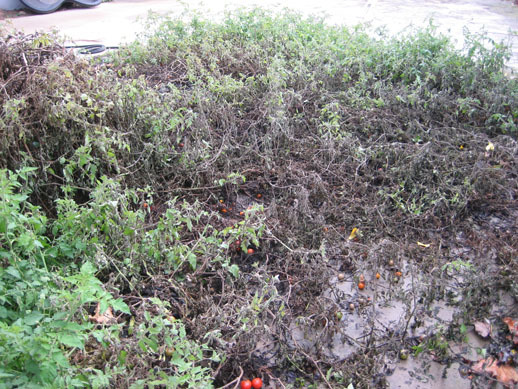 My once glorious tomato plants, a survivor of the summer season, reduced to a land of death by frostbite. The cold also kept it from producing very many fruits. 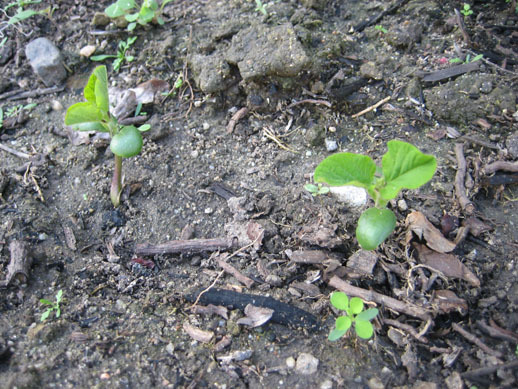 The vigor of peas (cool) versus beans (warm). I made a gamble that beans were hardy enough to survive winter. Where are the beans you ask? Exactly. 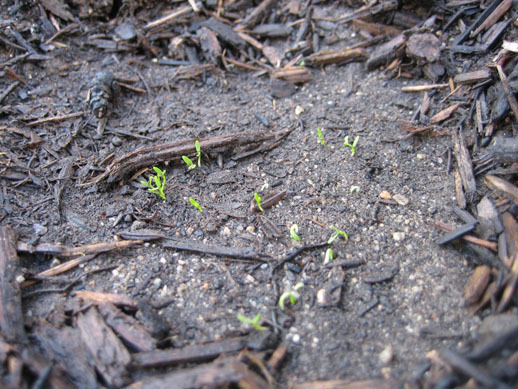 Somehow, I have managed to sprout the elusive celery seed. The process I used must have been a good one. Unfortunately, there are quite a few things I should have done differently. Nothing that will spell doom for my plants, but it could have been a much better crop. 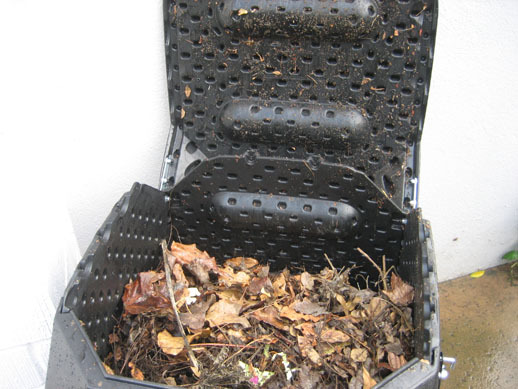 Or more accurately, the things that resided in said compost. Those little grubs I showcased in my last entry are responsible for the most annoying, frustrating, destructive forces ever to bear down on my garden. I have suffered several attacks thus far, not to mention various tunnels the worms themselves have been making. The pictures demonstrate how patchy some of my boxes are. 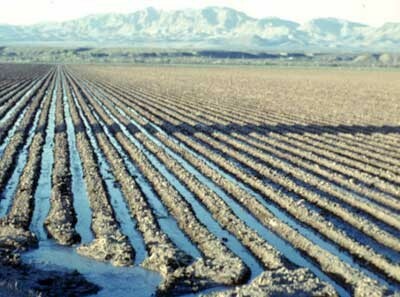 Granted, this could have been improved by lack of animal attack and more care when planting, but the traditional method of rows is just so much more efficient in terms of time spent planting and number of seeds required. What I should have done was either stick to the traditional row approach, or used transplants. My method was somewhat a combination of the two, but ultimately they are best left as separate techniques. I am also finding the distance which I spaced the plants was also too conservative. Upon thinning out some of the sprouts, I noticed that cool weather plants have very long tap roots and few laterals. Tap roots are the main root that extends from the base stem of the plant. Laterals are all the roots that shoot horizontally. What this means is that all the soil in between each plant is not very well utilized. I could have made my spacing a little more cramped and still had healthy plants. Lastly, the slow growth of the plants suggests to me that, while tolerant of winter weather, the plants actually enjoy environments more like early spring. In all, not too bad for a first timer with these types of vegetables. I'm still learning and probably will be for a long time. 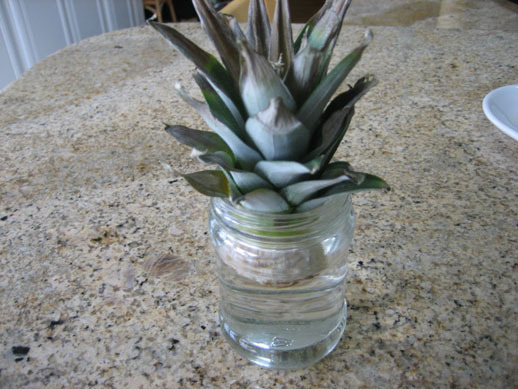 As a side project, I am trying to grow a pineapple plant from the leaf stub of a store bought pineapple. 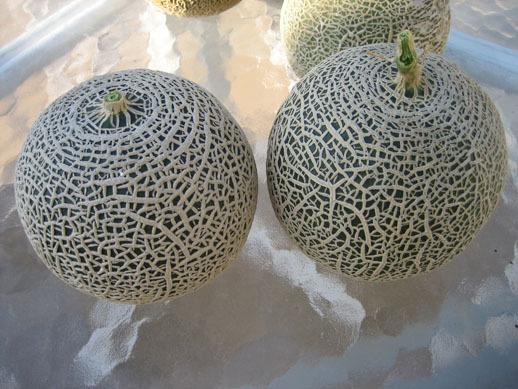 There are numerous instructions online on how to do this, but essentially it involves cutting off all the fruit flesh, stripping the bottom part of leaves, and placing it in water until roots form, after which it can be planted in a pot or outside. These are supposedly very easy to grow, but "easy" is a relative term. I will leave it at that. Growing is a slow, sometimes tedious process. All those pictures of produce in my first post are an illusion in a way. Behind their shining skin and luster lie hours and hours of effort, experience, and time. The actual edible portions of a plant are really just icing on the cake as part of the whole process of raising something from the ground. Eating the fruits of labor is simply validation of a job well done. Here's hoping this will be the case once again. Four weeks into it my garden is already a fiasco. Part of my initial idea for this post was predictions of potential issues, but unfortunately the problems came to me first. I woke up on Thanksgiving Day only to find disaster. My theory is the plots were dug up by either a raccoon, opossum, skunk, or some animal looking for food. 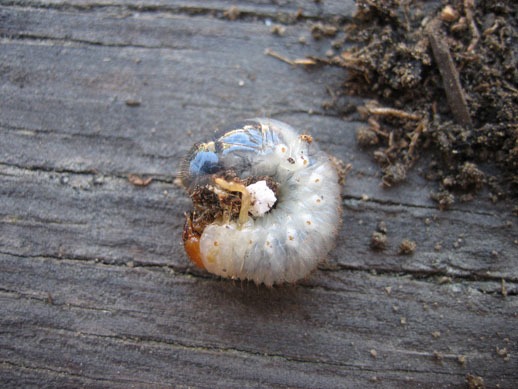 I base this off of large concentrations of these enormous grubs shown below. This is my fault because they came from the homemade compost I mixed in with the rest of the planter box soil. I didn't know what they were and didn't bother to look them up until it was too late. Larvae of various types of beetles, these grubs are considered pests partly because they eat the roots of plants, but in my case they did more damage attracting other larger pests. I can only hope most of the grubs have been eaten and the animals and birds will leave my garden alone. 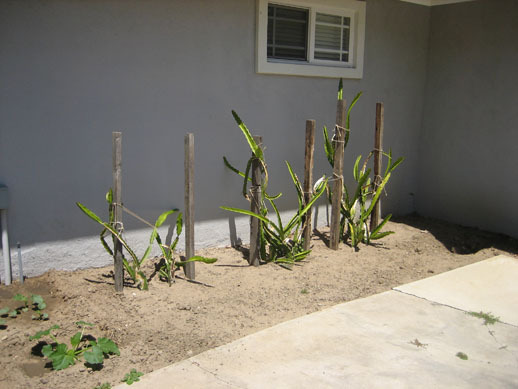 Since the attacks the holes have been covered and spots were replanted as needed. 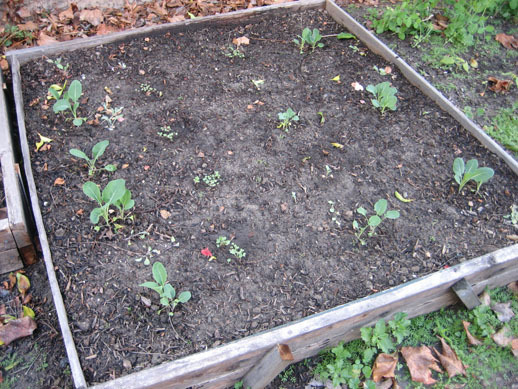 The good news is that most of the sprouts were not disturbed and have been coming along nicely. The plots look bare at the moment, but eventually they will grow out, fill up the boxes, and then some. The plan is to let the sprouts grow a little larger after which I will begin the thinning process. 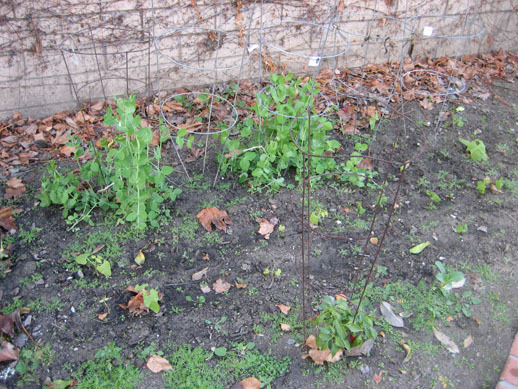 I also wait for the weeds to get bigger to be easier to pull out, and to let them become more distinctive so I don't mistakenly rip out the wrong plant. Peas, with a hint of frostbite. The differences between the plants will become more pronounced as time passes. The leaves develop their own shapes and shades of green, filling out to varying heights and widths. 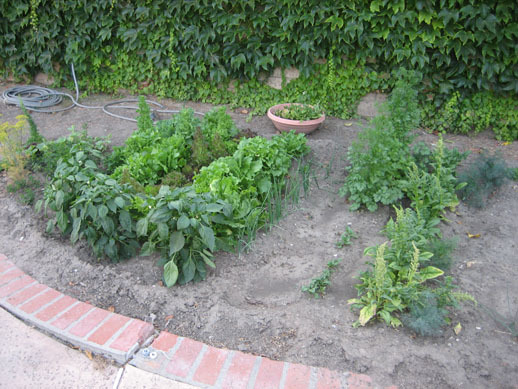 Over time it is more apparent why plant spacing is recommended as it is, and the once empty soil will soon be covered with the foliage of deliciously cultivated foraging food. Picking is a big part of the fun. Pulling out a carrot, harvesting kale, cutting heads of broccoli, they are all like opening a present, popping a soda can, or the start of a movie. There's a certain restrained, yet giddy excitement about it. I can't wait. There is one plant I have doubts about, and that is celery. If I were to pick anything that would be completely unsuccessful it would be celery. 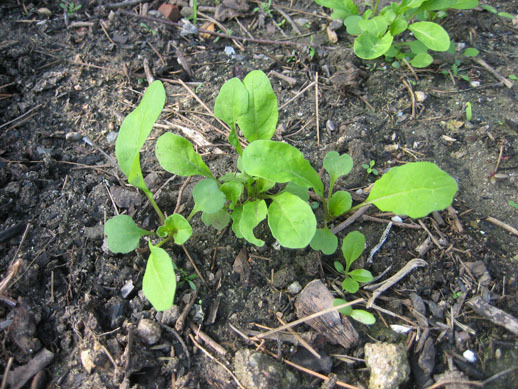 It is an extremely difficult plant to germinate, with many gardeners only growing it for the sake of the challenge. Worse yet, it appears there is not much different in taste or nutrition between store bought and home grown stalks. Nonetheless, I will try anyway. I have taken extra steps with this plant which I have chronicled below. My initial seeds failed to come up, so I decided to replant in the same spots, except this time using a bed of finely sifted compost. I used a homemade soil screener to do this. The screen is literally a cut out piece of the material used for window screens. 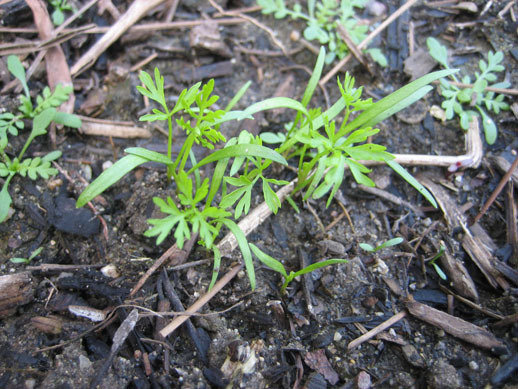 Celery seeds are tiny, so I went to minimize any large pieces of compost, rocks, or clumps. 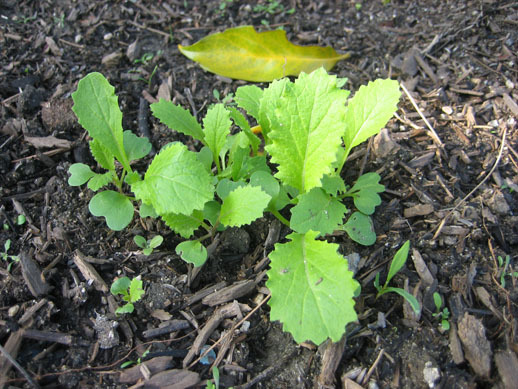 I have since found out that celery needs to be planted very, very shallowly. 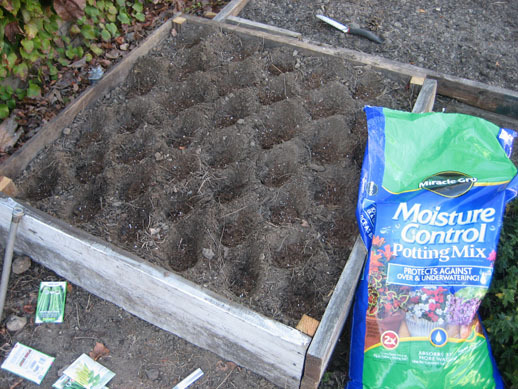 I placed the seeds on a lightly compacted bed of the sifted compost, then covered the seeds with about an eighth of an inch of the same stuff and lightly paddded it down with the bottom of a planting pot. If this works then I know this process is a good one. If it does not, well, I hear you can always root and plant the stubs of larger stalks. One of the main reasons I think the celery didn't sprout was the depth at which I planted it. In fact, there were several spots for many of my plants where this was true. One of the most important things I have learned from my garden thus far is to respect the recommended planting depth for these seeds, the small ones being particularly sensitive. It takes a lot of energy to climb up and bust through the surface, especially when your starting point is a 1/32" little ball. 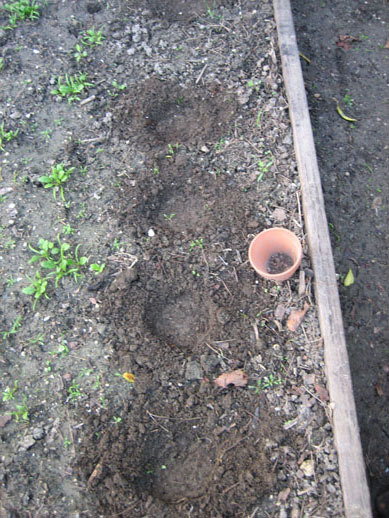 I replanted several spots in my garden, this time much more shallowly, with a much, much higher germination rate and speed. Be careful when digging and planting. That is all I can say. I post as my garden progresses and interesting things start happening. Growing is a slow process, and I'm not quite sure how fast these particular plants will develop. Perhaps I will intersperse these long intervals with random informative articles about various growing topics. Not that I'm an expert, but it is always interesting to be aware of the many facets of agriculture. Tune in later if you are interested in learning about compost, in depth discussions of certain types of plants, or whatever. Need seeds, questions, or comments, you know where to reach me. The topic for today is my foray into the winter growing season. Being in California, the term "winter" does not mean a whole lot, but temperatures are cooler and the days are much shorter which are optimal growing conditions for the plants I have in mind. I've mentioned before that most crops can be broken down into winter or summer varieties. In general, plants that produce some sort of fruit that can be separated from the main plant are summer varieties. These tend to be things like melons, squash, corn, beans, tomatoes, peppers, and so on. Part of the reason is that ample sunlight produces the sugars that makes the fruits taste so good. On the other hand are winter crops which tend to be plants which are themselves edible. Things like lettuce, carrots, cabbage, broccoli, herbs, and onions all prefer cooler weather, in part because excessive heat makes the plant itself taste bitter. 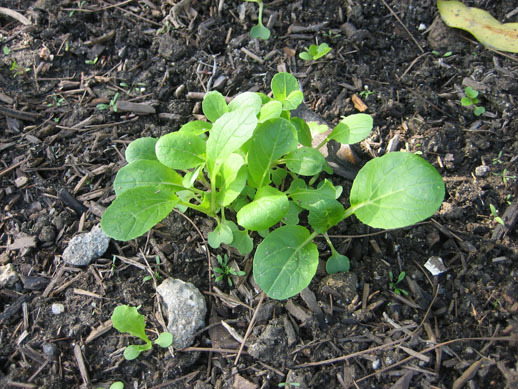 As a rule of thumb, winter edibles are roots, leaves, or some part of the plant that doesn't contain seeds. Does this blow your mind? It did for me. Keep in mind that what I am talking about excludes things like fruit trees, bushes, or any plant that survives longer than a season. Most crops I am growing are those that can be harvested for a period of time, then they either die or stop producing. Of course, things like trees have their own optimal seasons, but trees last forever, and require virtually no effort to get them to produce. Trees are boring. This is an interesting growing season for me because it contains a lot of firsts. In fact, most of what I am doing/growing is completely brand new. 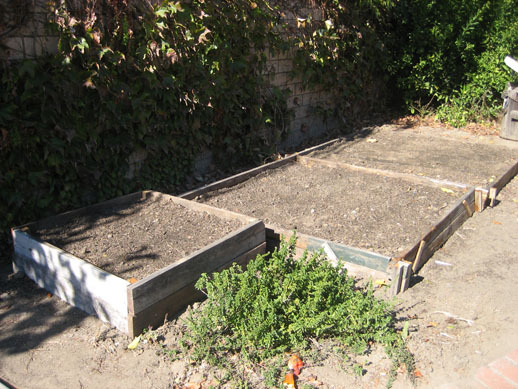 I've tried my best to research and set up the garden space to be as conducive as possible, but I would not be surprised to find a lot of failures as well. Traditionally, I've always had trouble growing winter type plants. This is probably due to growing them during the wrong season, growing them in poor soil, and not respecting proper spacing requirements. All these things I've tried to address with this new plot, and if this doesn't work, then I'm all out of ideas. 1. It elevates the soil grade so roots have more room to burrow, good for me since I have a hard clay layer about 5-8 inches below the topsoil. 2. Reduces water runoff since all soil is contained in the box. 3. 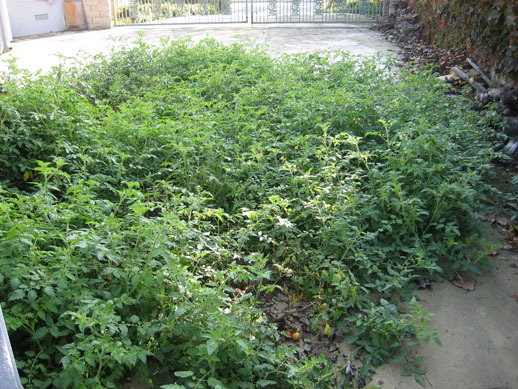 Reduces weeding time by concentrating growing in a well defined space. 4. 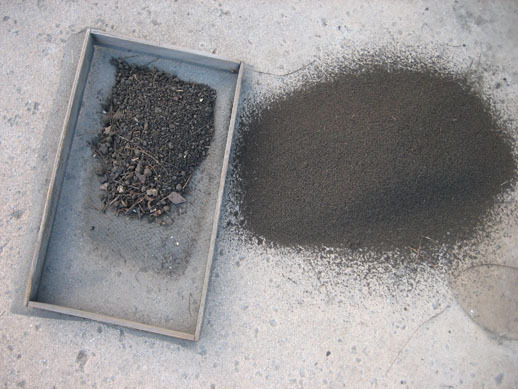 Any type of soil can be swapped into the box without fear of erosion or mixing with the existing soil. 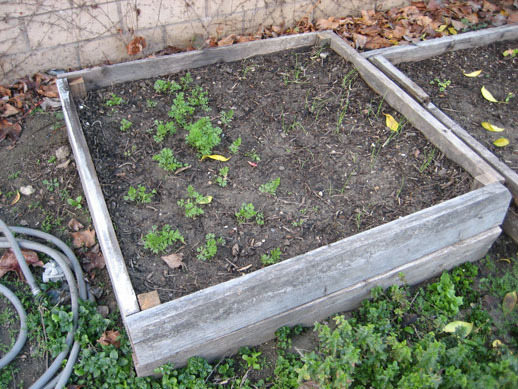 Planter boxes can be bought at any hardware store, but I decided to build mine out of old, rotting wood that has been sitting in my backyard for about a decade or more. 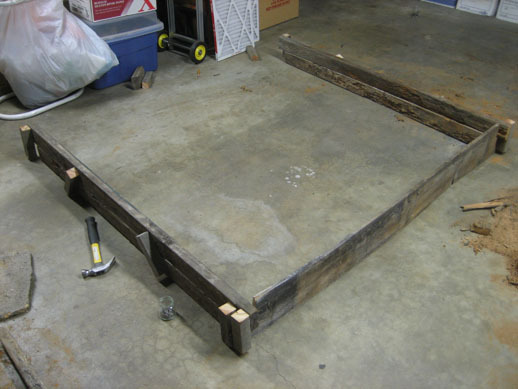 This posed its own set of challenges including warped wood, degradation by termites, and general grossness to work with. Tools I used were a power drill, circular saw, and a hammer and nails. 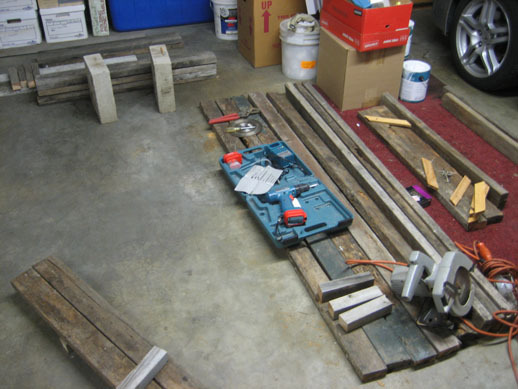 This is my workspace after sorting and cleaning the wood, then cutting them down into same lengths. Kind of like those food shows where all the food is prepped and ready to cook. My first design was to use four posts at each of the corners to which I would hammer the four sides onto. This proved to be cumbersome to build and produced very flimsy boxes. I took a different approach and made interlocking slots at both ends of each side of the box. You could take the four sides to the desired location and just snap it together like a jigsaw puzzle. The final result of building the boxes and filling them with dirt. The soil is a mix of Kellogg garden soil, Kellogg amendments, and my own compost that I've been working on since summer. The ratios of these three soils was determined by the recommended amounts on each bag. 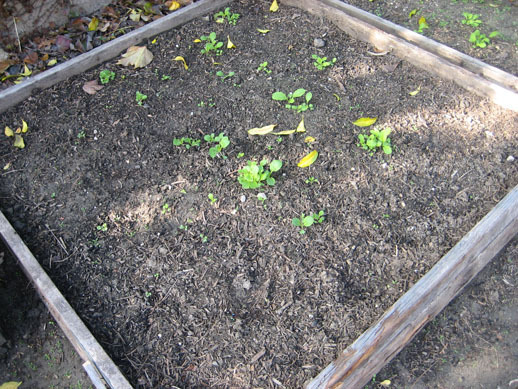 For example, most plants recommend a 2 inch layer of compost. 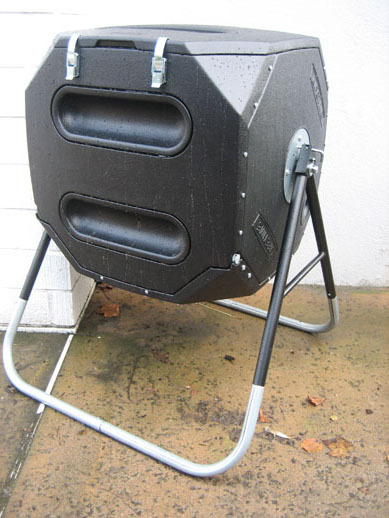 This can be used with the geometrical planter box area to get the volume of compost per box. Building and filling these boxes has been the majority of my effort thus far. Does not look like much, but trust me when I say it is intensive work. Until now I have always gone with the furrow approach, the method which creates those long lines of rows and trenches that are so symbolic of farmland. 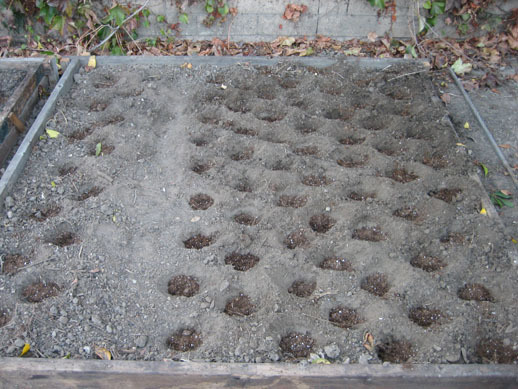 Recently I have been questioning whether this is the best approach for small scale gardening. There are three major flaws I've always encountered when using furrows. 1. The soil I have has fairly good drainage, which means water simply drains off the hill into the adjacent trenches. 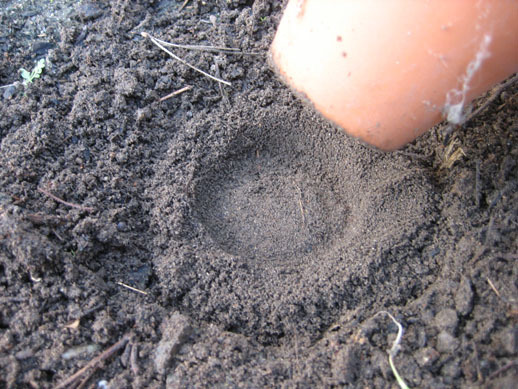 This leaves the mounds dry, which is especially bad for seeds in the germination phase. 2. Hills are easy to erode, especially when watered overhead, ie spraying everything with a garden hose. Overhead watering is never recommended, but setting up a drip system is quite a bit of work and may not be worth it. 3. It is difficult to get proper plant spacing in rows. 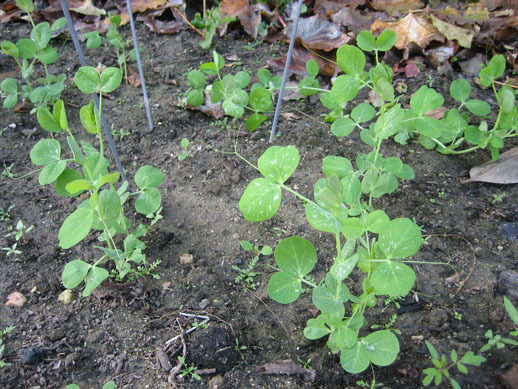 Seeds do not have a 100% germination rate, sometimes making the sprouts come up in patches. 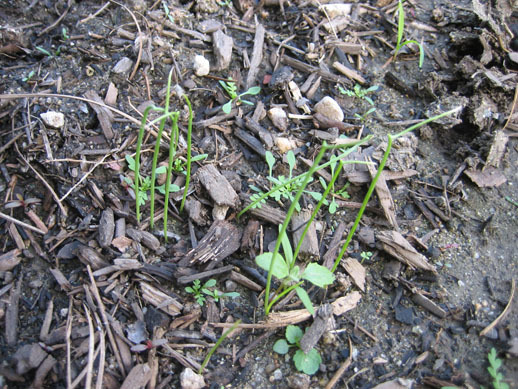 If this happens, the plant spacing is determined by wherever the plants have successfully sprouted. To combat these flaws I'm trying a new and sophisticated "hole" approach. In essence, I dig a shallow hole at the recommended thin spacing. Take some time to wrap your head around this revolutionary concept. 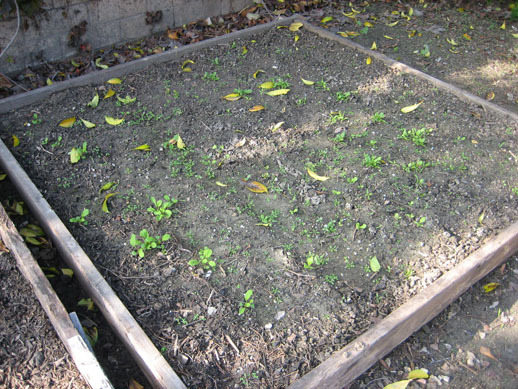 Thinning is the act of removing all but one or two sprouts in a given space. 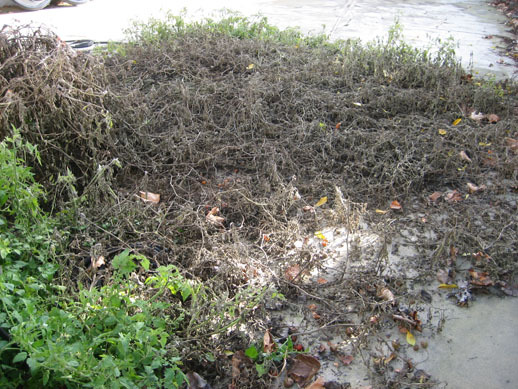 This reduces root competition for the remaining sprouts, resulting in bigger and more vigorous plants. What I mean by thin spacing is that there is a planting spacing as well as a thin spacing. 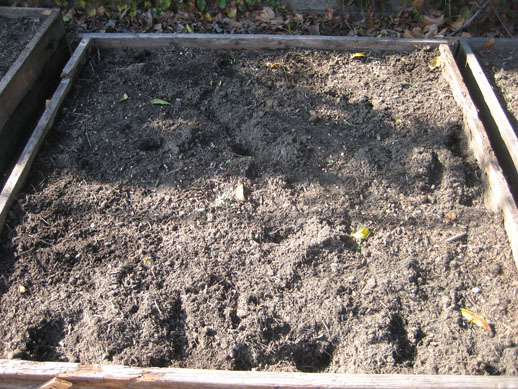 Seeds are recommended to be planted at certain intervals. 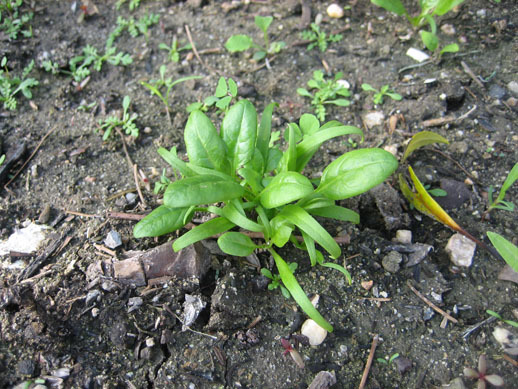 After they sprout, they are recommended to be thinned to slightly wider intervals. Why this is done is, again, because not all seeds will germinate. There should be an initial concentration of sprouts so that the best one can selected and allowed to grow. Thinning has always been tough for me emotionally. I always hate pulling out baby plants at the beginning of their journey. They had so much to live for! Back to the planting - after digging out the holes I filled the bottom with some of Miracle Gro's Moisture Control Potting Mix. This provides the seeds a bed of consistent and long lasting moisture. Why they call it "moisture control" potting mix is beyond me because controlling and keeping moisture is essentially the main function of any potting soil. That is like buying a toothbrush with a label that says "now with brushing power." Oh well, it was on sale. A view of all holes dug out and filled with potting mix. 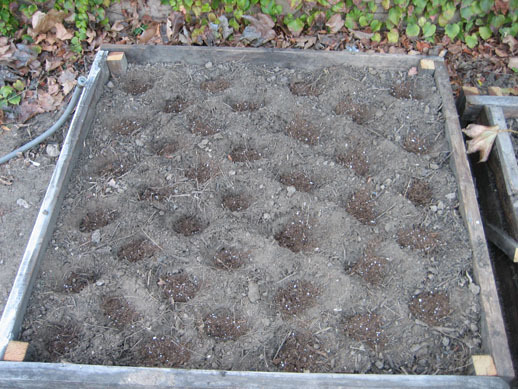 After this I put a few seeds in each hole, covered it, then soaked each box to wet the seeds and compact the soil. 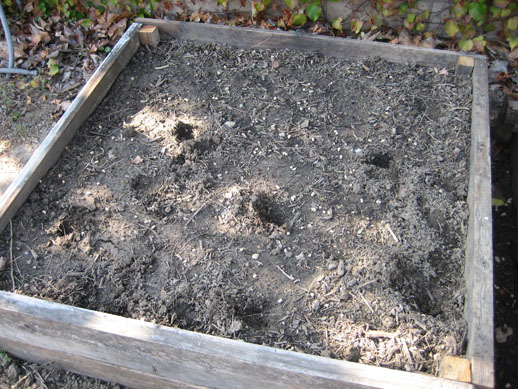 I don't have any pictures of the actual seeds in the dirt since they are tiny and blend in with the soil anyway. A last general tip. 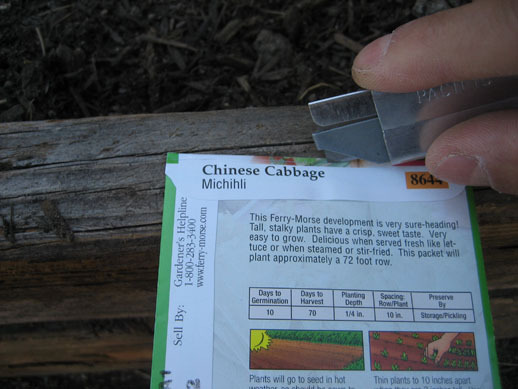 Seed packets are strangely hard to open without ripping them apart. I use a razor to slice the top open. This way the packet can be used to store the excess seeds for future seasons. Seeds will last a few years with proper storage. Wow, I thought I would include more in this post, but this is getting a little long. I'll stop right here and elaborate on other aspects the next time. Future topics will include potential problems, sprouting, and details on the types of plants I am growing. Any questions or comments feel free to contact me and I can put it in the next entry. Also, I promise I'll have more interesting pictures next time. Happy planting! Here we are again. You just could not get enough, could you? Welcome back to my blog, this time about my exciting adventures in growing things. Tired of eating store-bought fruits and vegetables? Then let us take a journey in shedding societal dependencies and learn self sustaining habits. Want to grow that overpriced "organic" food yourself? Me too. I'm tired of eating plastic. 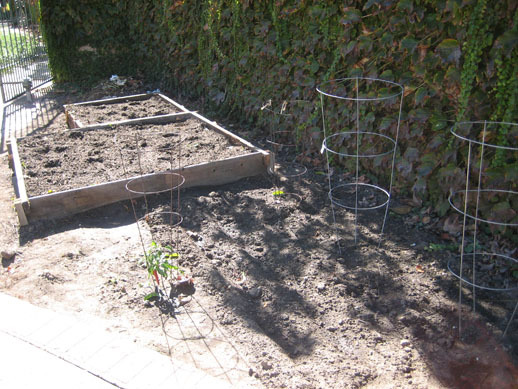 This latest subject matter is about my experiences in tending a garden. It is my most recent hobby and a topic with what I find an endless amount of fascinating material. It is hard to believe, but gardening is a serious amount of work. There is so much to learn about each individual plant, so much to do to work and cultivate the soil, and so much discipline required to consistently water and tend. But the payoffs can be well worth it. Something so simple, so primitive really, as the perfect skin of a sunsugar tomato or the waxy sheen of a freshly picked zucchini is extremely satisfying. Not to mention the superior flavor and texture versus a store bought equivalent. It's like having your cake... and eating it too! The season is winter time, which means it is time to plant things more suitable to colder weather. I don't have any winter pics or progress yet, so in the meantime here are some snapshots of my crop this past summer. I am fairly new at this, thus much of the subjects I will be writing about will be about my own conjecture. I can't put much here other than my own limited experiences, but hopefully my statements are factually correct, and that someone reading this might learn a useful thing or two. Fortunately, my backyard is full of dirt. This allows me to experiment and to have some impressive domestic production. 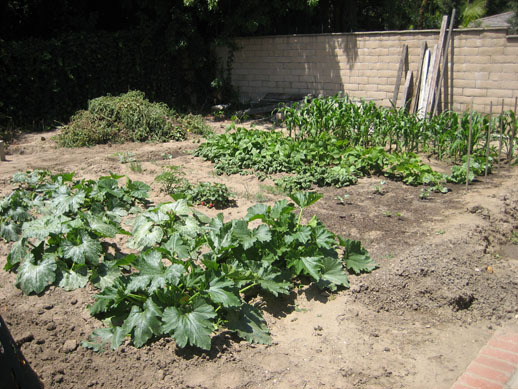 Shown above are the before and after pics of the main garden area. 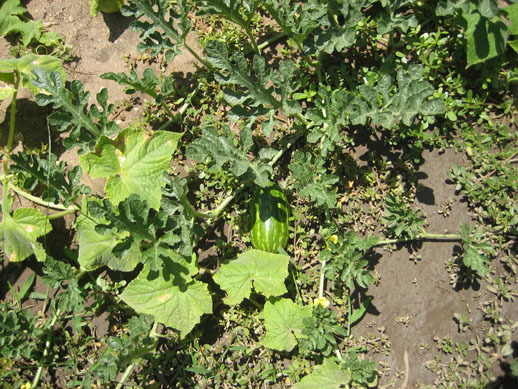 Included are a few types of squash, cucumber, corn, beans, spinach, watermelon, and a type of winter muskmelon. Where did I get all these seeds? You can go out and buy them at Home Depot, but in my case these were mostly grown from seeds harvested from previous generations. Another plot of dirt where I grew salad bowl lettuce, coriander (cilantro), more spinach, dill, arugula, green bell pepper, mint, and red onion. I never knew why these particular plants grew better in this patch until I discovered the concept of winter and summer crops. Generally, leafy plants like those shown above enjoy the cooler weather, which is appropriate since this spot is much shadier and cooler than the main patch. This guy is a neat little tomato of, I think, the Indigo Rose variety. 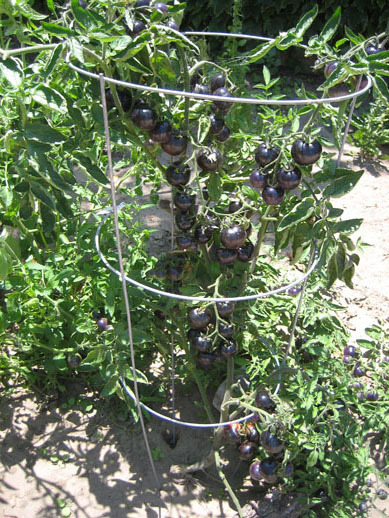 I believe this type of tomato was first cultivated at Oregon State University and is also called OSU Blue, though it looks purple to me. The color comes from a pigment similar to that found in a blueberry and contains a lot of healthy antioxidants. I actually hate raw tomatoes (I just like growing them) but I hear it tastes like a normal red tomato. Sorry. Dragon fruit, a cactus fruit popular in Southeast Asia and Mexico. After two years of growing, this lovely plant has given me absolutely nothing. 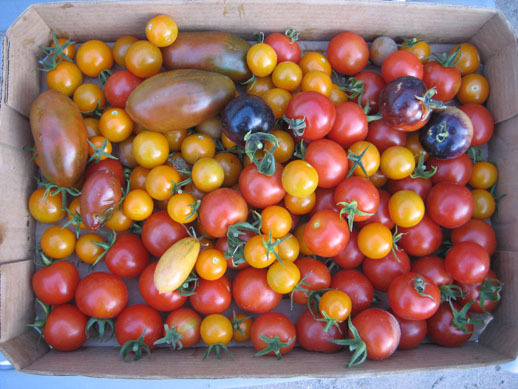 A sample of the different types of tomatoes I grew, and also an example of the kind of quantities possible with healthy plants. This is from a single day. Sometimes I would get this quantity from a single plant. Add to that a steady supply of squash and beans that need picking and it is easy to see how gardening can balloon into an unnecessary and relentless amount of work. The beginnings of my prize plant, the watermelon. They are always so cute in the beginning. Why did I grow a watermelon? Because it is awesome. 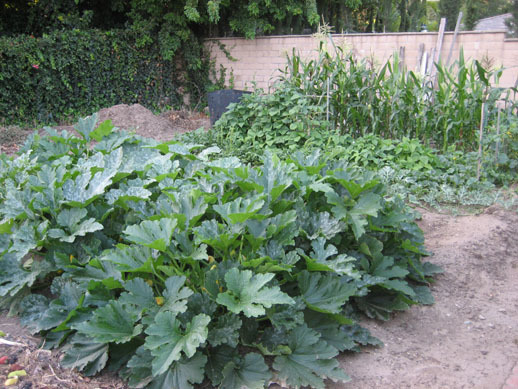 Watermelon plants need a lot of space, good soil, lots of water, and lots of heat. They are fairly demanding to get a good fruit, but to anyone who has ever eaten a home grown watermelon, it is worth it. Plus, it's orange. Didn't know they came in orange, did you? Oh, the things you will know... after reading my blog. 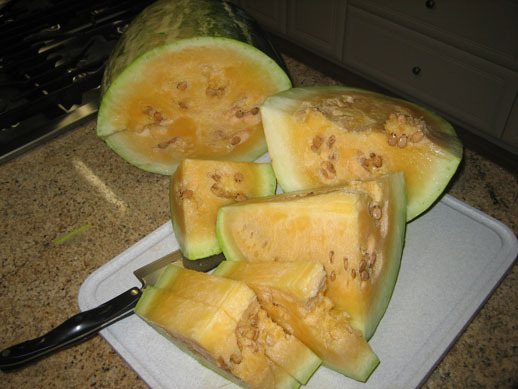 A picture of some muskmelons. These in particular were almost perfectly round and had excellent reticulation, which is that weird beige netting. Muskmelons are an absolute pain to grow. If the bugs don't get it, the birds might. If you water them too much they'll split. 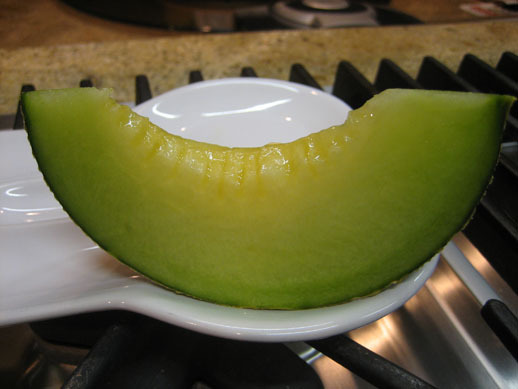 Lastly, there is zero indication when the fruit is ripe. These pictured are perfect probably because the vines they grew on were suspended off the ground on trellises. I cannot even count how many I lost to the elements.